Life got in the way of a pecan pie baking spree, but I did manage to make four. Out of the four, I was able to nail down a really good, straightforward, classic pecan pie recipe. The best pecan pie (at least for now) is based on a recipe from “Cooking Pleasures” magazine. What I like about it is that it sets up nicely at room temperature, is soft (but definitely not runny), and has a rich caramel flavor. I modified the original recipe by dry-toasting the pecans for two minutes and then stir-frying them in the butter. 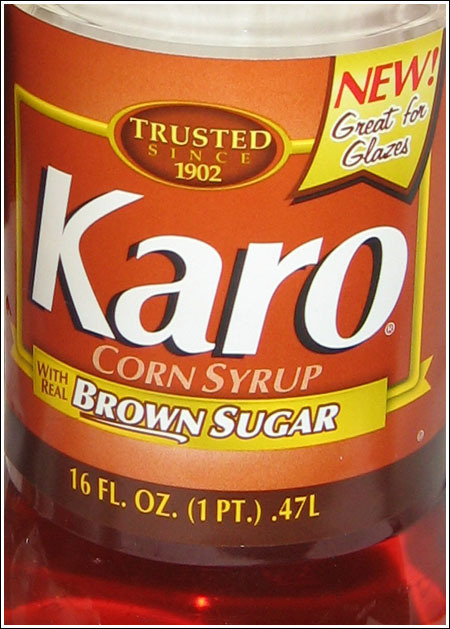 I also used Karo’s new “Brown Sugar Blend” corn syrup, which added more caramel flavor. Light corn syrup would also work. The Best Pecan Pie Yet -- or at least, one of my favorites. Preheat oven to 350 F. Place pecans in a large skillet and turn heat to medium high. Cook pecans for 2 minutes, stirring often. 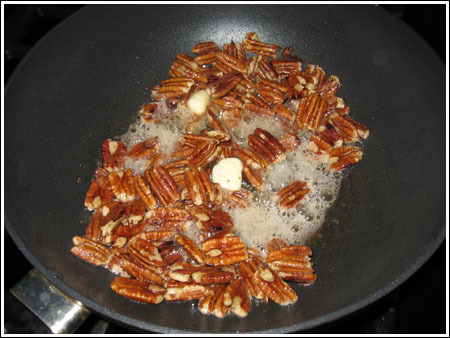 Reduce heat slightly, add butter to skillet with pecans, and "stir-fry" butter and pecans until butter melts and browns - take care not to burn. This should only take about 3 minutes. Remove from heat. In medium bowl, stir or lightly whisk together eggs, corn syrup, brown sugar, cream, vanilla and salt. Stir in melted butter/pecan mixture then pour filling into unbaked crust. Bake for 45-50 minutes or until top is golden brown and appears set. The pie should still be slightly jiggly in center. Let cool completely at room temperature. Transfer to refrigerator to chill. This pie also freezes quite well. Thank you for this recipe!! I made this for Thanksgiving, and it was SO delicious that even those who don’t normally like pecan pie LOVED this one!! It was also really quick and easy to make. The butter roasted pecans were especially delicious! I will be making it again for Christmas!! 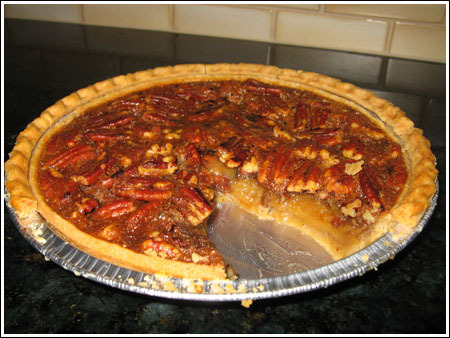 I was looking for a pecan pie recipe for today’s farmer’s market pies. Yours looked great, directions and photos clear. I used light corn syrup. They turned out great! Thank you! Mariam, why don’t you try par-baking it this time? Can’t hurt. Now I did not have to par-bake mine (I used Mrs. Smith’s) but I think par-baking might not be a bad idea for certain other brands. The only explanation that I came up with is that maybe I was a little overzealous when I docked the crust? I plan to try it again, though I can’t think what else I’d want to change. It *is* a pretty darned good pie. Mariam, that is interesting. Was there a hole in the crust? That sounds like a pretty wild pie. I tried making this yesterday, and it turned out pretty yummy, but for some reason, the filling slipped below my crust, (ie: pecan layer, crust layer, yummy buttery layer) and resulted in a bit of a messy pie. I blame my frozen pie crust. For this pie, you do not toast the pecans in the oven first. You heat the dry skillet, add the pecans to the dry skillet, and warm them up (they won’t be completely toasted at this point), then add the butter to the skillet with the hot pecans. The butter melts just as the pecans start to release their oils, so there’s a convergence of flavorful fat and then I suppose, the pecans absorb it back up into their little pecan bodies. They’re not toasted and crispy at this point, but rather (I suspect), fully loaded with pecan oil & butter (fat). So whatever fat they absorb seems to help them bake up nicely during their stint in the oven. Do you dry toast the pecans in the oven first or do you toast in a skillet and then add the butter to do the stir frying? Do you really find that doing this produces a crisper pecan in the finished pie? CONGRATULATIONS on winning the Bake-Off Contest!!! I was so happy for you and your daughter when you won! Again, congratulations!!! I watched you on the Food Network again tonight! I get so excited for you at the end and just love your expression when they announce that you won. The best part is when you tell Fuzz she gets her bouncy house! I’m so happy this one was a success. The picture looks great! I got some feedback on the pie. Todd and my friend both agreed it was the best-ever. Now I’m not saying it’s the best in the world, but it was the best of all the ones I made. Ali, Don’t wait until Thanksgiving, try it now! V, sorry about the weight gain. Maybe it works the opposite way. Perhaps reading about diet food will make you lose weight. Peabody, the brown sugar Karo is now widely available here in Austin. Alison, Todd likes his pecan pie at room temp. I haven’t seen the brown sugar kind, I will have to keep my eye out for it. gosh. just reading your blog is making me put on weight!! Saving the “best one yet” for Thanksgiving. Thanks for sharing!